With a Federal election being tipped for mid-May 2019, and an April budget to accommodate it, it is hardly surprising that the budget handed down on 2 April had a number of initiatives clearly focused on specific community groups and marginal electorates in the hope of influencing electors’ voting decisions. It just would not be a pre-election federal budget without such sweeteners. But let’s not confuse the issues addressed by such a budget with those upcoming electioneering should be addressing! It has been a lament regularly repeated in this newsletter that both government and opposition have consistently failed to lay out a coherent vision for where Australia should be heading. Policy initiatives have been reactionary rather than visionary, short-term rather than encompassing medium to long-term perspectives, political rather than statesmanlike. Focus has been disproportionately placed on economic outcomes and budget results, with insufficient regard to the social and ecological contexts within which they sit. The very changeable nature of our contemporary world calls for a shared vision and strong effective leadership. When Australians are asked what they think the main purpose of democracy is, the answer twice as popular as any other is “ensuring people are treated fairly and equally, including the most vulnerable in our community”. It would seem that the Australian concept of a ‘fair go’ is still alive, albeit not well served by current economic and social government policies. SPC readers will also recognise in the second part of Moran’s article the need to embrace the approach of subsidiarity (which he also refers to as localism) into the policy conversation. This is a principle firmly embedded into Christian social thinking which also incorporates the principle of a ‘fair go’ by reference to the concepts of the common good and the dignity of the human person. Of course, the principles of Christian social thought do not of themselves constitute the ‘vision’ much needed in Australian political life. They do, however, constitute a sound ethical framework from which such visionary development could be undertaken. When party election manifestos are exposed, it would serve us all well to subject them to such an ethical critique. Each of us could doubtless produce our own list of areas which should be embraced by these manifestos. The growing inequality of income and wealth in Australian society. 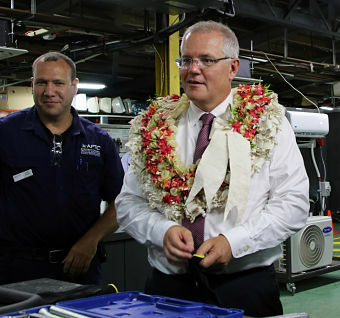 Failures in Australia’s aid and diplomacy in the Pacific region, faced with the ambitions of China and the unpredictability of US policy. There are, of course, many other very worthy contenders: indigenous inclusion, immigration and asylum seeker policy, corporate and governmental governance, taxation reform, and continuing failure substantially to address access to affordable housing for large numbers of Australians. Particularly disturbing is a further cut to overseas aid of $115 million. Our aid has been repeatedly cut over the last six years from $5.05 billion to $4.04 billion. Tim Costello, Executive Director of Micah Australia, said the government was treating our aid program “like an ATM”, diverting money elsewhere. Australia is the richest country in the world in terms of median adult wealth, but we have become one of the least generous of rich countries. The Frydenberg budget has failed to address the issues of inequality and poverty, and does not auger well for the platform that the Coalition government will take to the election. Unbelievably, the budget has done nothing to lift Newstart unemployment benefits, which have not increased for 25 years, and remain at $40 a day. Lifting Newstart by $75 a week would cost $3 billion a year, a quarter of the cost of tax cuts already legislated for taxpayers on over $90,000 a year. As an open letter from the broad community services sector highlighted, some three million Australians are living in poverty. Many social service networks are calling for the abolition of ParentsNext. Its harsh policies have suspended payments to one in five parents, particularly harming single mums and indigenous families, some of our most disadvantaged people. In recent elections, voters have been subjected to character attacks attempting to shift the focus from substance to personality. They have also been subjected to appeals to ‘mums and dads’ and ‘working families’, as well as attacks on ’the big end of town’ and ‘fat cats’, designed to avoid critical analysis of the details of proposed policies. Let us hope that, this time around, there is genuine recognition of a changed political landscape and the need for substantive and considered policies which cohere to a vision of what Australia can become. With respect to the entrenched problem of growing inequality, let’s not hear the claims of ‘class envy’ or the like, but rather informed and compassionate consideration of the plight of the millions of Australians currently living in poverty. While addressing the fact that current levels of benefits should form part of that discussion, a wide canvas is called for, encompassing social, financial, and economic policies, to assist in removing the root causes of poverty. In a country like Australia, such widespread poverty is unquestionably a confronting signal of policy failure! Let’s hope that the pre-election period gives rise to meaningful debate on the way forward for Australia and critically for Australians. At a recent SPC Forum, Sr Pat Fox gave a very disturbing account of the killing and human rights abuses in the Philippines she witnessed before President Duterte had her deported from the country. Excerpts from her address at our SPC forum on 5 March 2019 are on our SPC YouTube page.